Big news today for Embedly, the service that makes it easy to embed content from nearly any site on the web. Today the company is announcing that it’s raised another $450,000 in a round that includes Howard Lindzon, Social Leverage, Venture 51, Adam Schwartz and follow-on investments from Betaworks and Chris Sacca, who participated in Embedly’s $250,000 round last August. Schwartz will be joining the company’s board. But funding isn’t all Embedly has up its sleeves: it’s also announcing some changes to the way its APIs work. Namely, it’s combining its existing services into a single API to help reduce developer confusion. 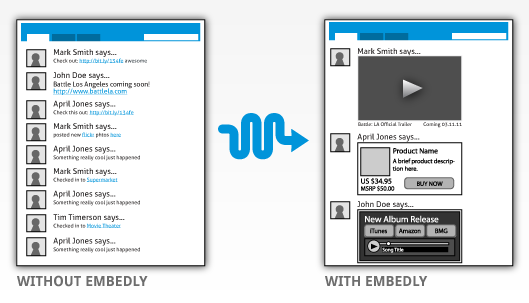 Embedly has offered both a free standard API — which can be used to embed content from sites like YouTube, Rdio, and Twitter — and then a second, Pro API that can glean content from any site and generate nice-looking embeds (it’s like the story creator used by Facebook, but anyone can integrate it). Before now these have been two separate APIs, and now they’re be combined into one (you can sign up for the API here). Finally, Embedly is sharing some new stats. The service is now used by 1,200 sites and services, including Hunch, Bit.ly, StockTwits, and Yammer (they note that Lindzon and Schwartz both actually use Embedly for their own apps). Across all of these sites, Embedly serves 2 billion impressions per month for its embeds. To put that in perspective, they were serving around 4 million URLs per month in July 2010.